In the game, player 1 controls Popo (a boy dressed in a blue Eskimo parka) while player 2 controls Nana (a girl dressed in a pink Eskimo parka). 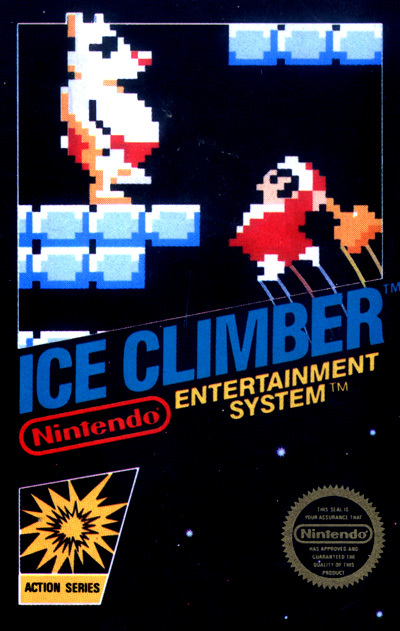 Their challenge is to venture up an ice-covered mountain and recover their stolen vegetables from a giant condor. The only tool a player has is a hammer to make openings on the ice layer above and to club enemies. Each mountain consists of eight levels of colorful ice and a bonus stage. Standard, dull ice blocks pose no threat other than an easily disposed of barrier. Ice blocks that appear more square and detailed are indestructible forcing the player to take another path. The darker ice with diagonal lines act as a conveyor belt sliding the Eskimo either to the left or right. Finally, many mountains include cloud-shaped, moving platforms as an additional hurdle. The bonus stage takes place at the peak. With a time limit of 40 seconds and no enemies, the Ice Climbers often face trickier jumps and multiple moving platforms. It is also the only place they can snag back their stolen vegetables, most notably eggplants. At the top of the peak, the condor flies overhead. Grabbing its talons before time runs out gives the player a large bonus. In the original Japanese version, the yeti characters were seals.